Add an everlasting bloom to your deck using the Ancient Graffiti Kinetic Flower Deck Spinner. This moving sculpture brings drama to any setting with ease, and its dual toppers evoke a flower for a charming look. Each of the seven petals on these accents arches inward and has a slight curve, for capturing even a slight breeze. The petal shapes emanate from a center hub, with hidden bearings which help the toppers spin. The brown hue lends an antique feel to this item, furthered by its verdigris colored highlights. The dual toppers connect to the sturdy, 19.25" tall shaft, and its twisted body adds to the spinning motif. The clamp at the bottom of this shaft attaches to deck rails from 0.5" to 3.5" thick, and a thumbscrew at the base keeps this item secure by pressure, rather than drilling a hole into your deck. The iron construction is perfectly suited for use outdoors for many seasons, and the brown and verdigris finish offsets your foliage. 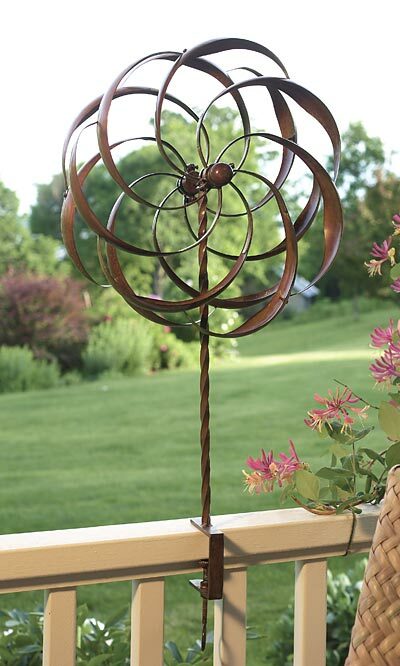 Enjoy flowers on your deck all year with this Kinetic Flower Deck Spinner. Assembly required.